I recently caught up with a few Via Rail corridor trains. I have been meaning to get out and get some shots while there was still snow on the ground. It's been a busy winter with precious few chances to catch anything trackside with a little snow in the shot. Luckily, I was able to make the most of my chances. One of my meets was lucky. I was driving home and made sure to check out a few trackside spots long the Smiths Falls Sub. When I was driving north along Moodie Drive, the crossing barriers came down. The road was empty so I slowed down and tried to set up a quick shot of an eastbound P42 makings its way to Fallowfield Station. P42 911 still had its Canada 150 wrap minus the Canada 150 logo. Not the best shot in the world, but it was the best I could do in a rush. The next day, I dropped by Via's Central Station on Tremblay Road to check out if anything was worth shooting. This was the first thing I saw when I arrived. A Via crew was inspecting another wrapped P42 on a stub-end spur. This was the first Via 40th anniversary wrap I have seen. It makes this unit look brand new. My plan when I arrived at the station was to get a shot of the departing Train 24, which was about to leave for Montreal. I also wanted to catch a glimpse of Train 45, which was scheduled to leave 11 minutes after Train 24. But, given the construction on the new platforms around the west end of the station, there was no space to stand trackside. So, I made my way to the Belfast Road overpass to set up for Train 24's departure. Before the Montreal train left, I got a quick shot of two parked trains parked on the south track end to end. One train had an LRC Business Class car hooked up to three of the old streamliners. Nice mix of equipment. You might notice a bit of wire in the bottom of this shot. Getting clean shots of the Via station from the Belfast overpass is next to impossible. I tried to shoot between the wires a few times, but I never could seem to get them out of the frame. Here's Train 24 with an F40PH-2 leading a consist of the Renaissance equipment. Those who know this stretch of track might wonder why there is such a long shadow on the south side of the track. That shadow is cast by a long sound barrier that was erected as part of the construction of the O-Train Confederation Line Belfast Yard. More on the O-Train next week. But, by way of comparison, here's a post that shows you what this stretch of track was like before that long sound barrier was put up. I snagged a few shots of Train 24 as it gained speed and the F40 let out a bit of smoke. The long shadow of the sound barrier is really noticeable in this shot. I really like this shot, especially the smoke coming out of the F40. Back to that newly wrapped P42. Right after Train 24 cleared the scene, the P42 backed out of the stub-end spur and backed up below the Belfast overpass, which allowed me a great opportunity to get this unit in full sunlight. This was Train 45. Soon after, a switch moved, this train took over the main track next to the station and began to board passengers for Toronto. I was happy to get a look at Train 45, which I had not expected. Nice little bonus. I snapped a quick shot of the new raised platform. Work is still ongoing, but you can see that some of the newly raised platforms are done. And here's one last shot of Train 45 before it gains the main track next to the station. All in all, it was a productive couple of meets for me. I did manage to see a bit of a 40th anniversary wrapped LRC coach but was not able to get any quality shots of it. Something to look for the next time I am trackside. Those who know their rail history know that Ottawa was once a key point along both the Canadian National and Canadian Pacific main lines. Without going over the rail rationalization that began to reshape the city in the 1950s and late 1960s, it’s still significant to note that the city still hosted a substaintial rail presence into the early 1990s. When CP left Ottawa for good in the late 1990s, the city was left with just the Ottawa Central and Via Rail as its rail carriers. It was a far cry from the city’s rail heyday when the capital was served by three major railways. It would be easy to forget that the city was once served by another major railway other than CN and CP. 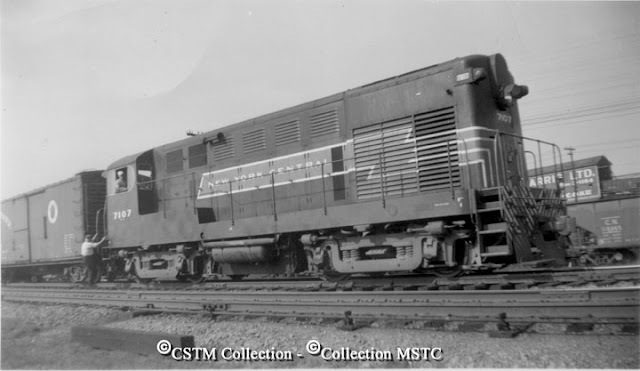 Until the 1950s, the New York Central operated a division that extended from northern New York State through Cornwall up to Ottawa. For the full history of this fascinating division, I would suggest checking out the New York Central Ottawa Division website. I haven’t spent much time on this aspect of Eastern Ontario’s rail history. But it’s an interesting chapter in this region’s rail history, mostly because so much of the story has been lost over the years. But look at some of the placenames in the city and you’ll see the remnants of the NYC. For example, Hurdman transit station, Hawthorne Road and Ramsayville Road all share their names with points along the old NYC Ottawa Division. Hurdman was once a key junction for several prominent rail lines, but it’s often overlooked that the NYC used this junction as a way to access the old Union Station in downtown Ottawa. 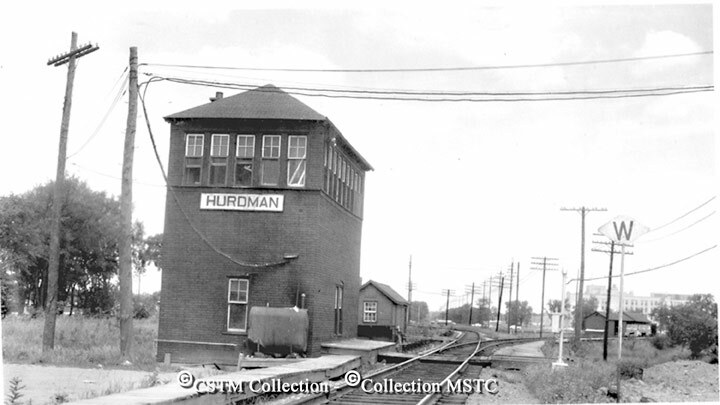 Hurdman was a major junction for all of Ottawa's major railways at one point, including the NYC. This junction was scrapped and made way for a city bus transit station. The new O-Train Confederation Line aligns through Hurdman. When you look south of the city, you may be able to scour for traces of the old rail link in Russell, Embrun, St. Albert, Crysler, Finch and Cornwall. The Ottawa Division, of course, crossed over the St. Lawrence River at Cornwall, until it was abandoned in 1958, when the link across the river was discontinued and scrapped, as construction proceeded on an expanded St. Lawrence Seaway international shipping waterway. Look closely in Ottawa and you might see some hints of the old NYC system. For example, before it could reach an agreement to share a central passenger terminal with other railways, NYC trains terminated at a station on Mann Street at the edge of Sandy Hill. Later, when the Union Station was completed in 1912, NYC trains finished their runs there. But in 1941, the railway reverted back to its Mann Street station. This point was key for the railway, as there were other facilities for the railway here to service steam locomotives, for example. After the war peak, which brought record traffic for many North American railways, the traffic levels of the Ottawa Division fell sharply. Truthfully, the promise of a rail line between New York and Ottawa never really materialized. Business interests on both sides of the borders had dreams of tapping into the potential of this link in the late 1800s, only to find that the riches were never really there. That was the reason why the two groups on either side of the border joined to build this line and link Ottawa with New York State. 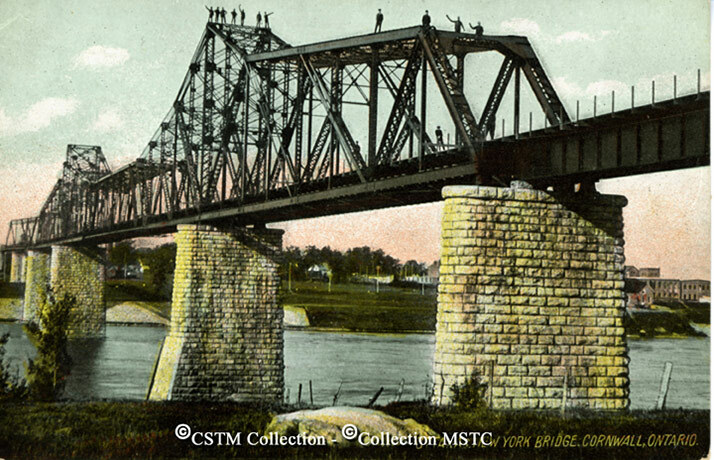 The Ontario side of the operation began running revenue service in 1897-98 and began through service to and from New York by 1900 when the link over the St. Lawrence was completed. 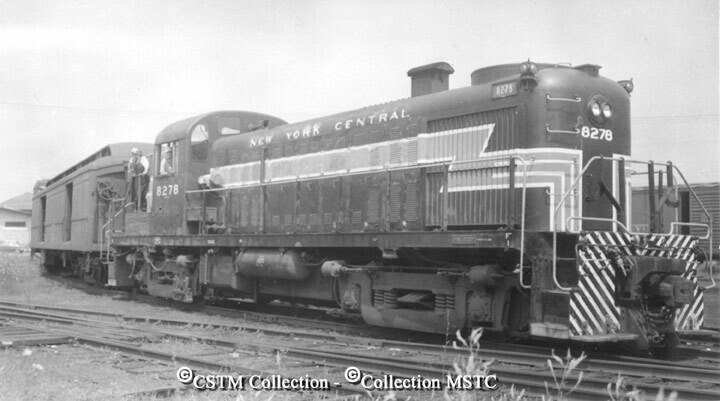 The New York Central bought out the line in 1904 and officially merged it into the NYC system by 1913. The NYC had had enough by the mid-1950s. In 1954, it discontinued passenger services. All operations were discontinued by early 1957. 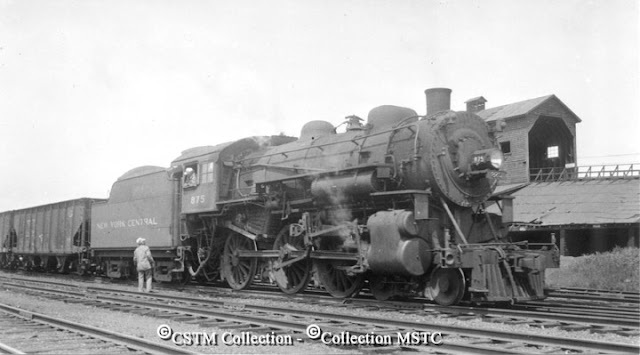 In the same year, the Canadian portion of the line was sold off to CN, which scrapped most of the line for the rails, which it used in Montreal. Small portions of the NYC were retained in Ottawa, but most of those portions were removed in 1972. I should also credit Colin Churcher's wonderful rail historywebsite for some of the research I was able to do for this post. If you have time, it is well worth scrolling through this site for a while. Also, feel free to check out my own post about another long forgotten NYC branch in Southwestern Ontario. What's to become of CSX in Canada? The CSX I knew seems to be disappearing right before my eyes. First there was the upheaval when Hunter Harrison took over and then there was his untimely death. Say what you want about the man, he got results. For my part, I’m not about seriously question his methods, other than to say that I think there is an extreme lack of long-term thinking among publicly traded companies, especially railways. There has been a lot of debate over the fixation over quarterly number. As a former business reporter, I understand how the game is played, but I have to wonder how much is enough? How long can you slash, burn and defer for the sake of making a quarterly target, even if you’re sacrificing your long-term profitability? I’m not necessarily saying this is the case with CSX, but you look at the scale of the cutbacks the company is considering and you wonder what will be left when the hedge funds are finished with this company. April 1991 - A northbound CSX mixed freight waits on the Sarnia Subdivision, just south of the St. Clair Boulevard crossing. That empty field behind the train is now a subdivision. For me, CSX has been a lifelong fascination. The railway’s Sarnia Subdivision passes through my hometown. For how much longer is anyone’s guess. When I was younger, CSX operated from Sarnia all the way to Chatham, where it interchanged with CP. At one point, the rail line went all the way to Lake Erie, terminating in Erieau, but that was before my time. Now, the railway switches a few refineries in Sarnia and maintains a scant presence between the Chemical Valley and its remaining customers south. CSX only goes as far as Sombra. South of that, the line’s service has been discontinued through Port Lambton, Wallaceburg, rural Kent County and Chatham. This past summer, I caught a short local returning to Sarnia from Sombra. At the time, I wondered if that meet might be the last time I saw the CSX passing through my hometown. I’m thinking it was. I can remember back when the railway was much busier, often shuttling long trains of interchange traffic between Sarnia and Chatham, with countless autoracks, auto parts high-cube boxcars among its usual tank cars and hoppers. 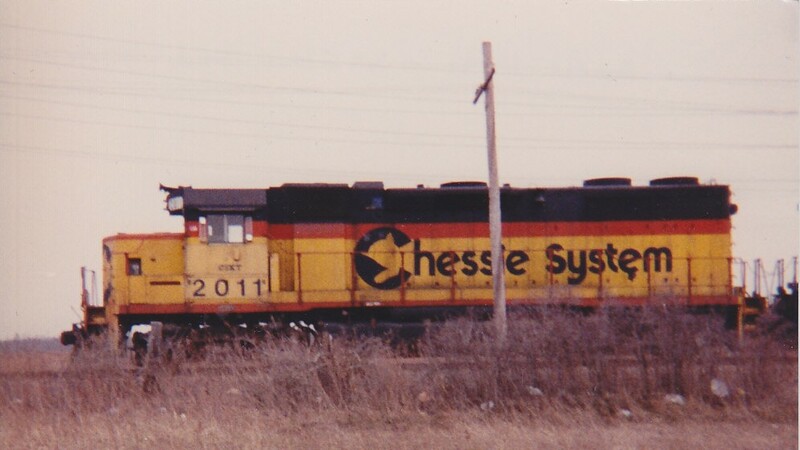 In the 1980s, nearly all the GP38s were painted in the Chessie scheme, a scheme I didn’t like at the time but have grown to appreciate. There were even a fair number of B&O and even C&O painted geeps plying the rails. At some point in the late 1980s, the drab silver and grey CSX scheme popped up. By then, the writing was already on the wall. The trains were getting shorter and less frequent. By the time I moved away for school, the interchange traffic from Chatham was largely gone and the railway’s customer base in the Valley was shrinking (Dow Chemical left in the mid-1990s, Ethyl closed and a few other operations left the area afterward). Summer 1991 - Autoracks and cabooses? This was back when CSX linked the CP in Chatham with CN in Sarnia. Although there is optimism that small-scale industry is on its way back to some of these old refinery sites, I don’t think the CSX will want to wait around for an economic rebound. Its Sarnia Sub is already disconnected from the rest of its network. As some continue to speculate, the Ontario Southland Railway might be a prime candidate to pick up the trackage from CSX and assume operations. The one wild card I’ve heard is that the City of Chatham-Kent owns the south end of the line and has been searching for an operator to resume rail service for the mainly agricultural customer base on the south end of the line. That process has dragged on for years with no success. One has to wonder whether the addition of the lucrative switching business in Sarnia would make such an acquisition more palatable to the colourful shortline. 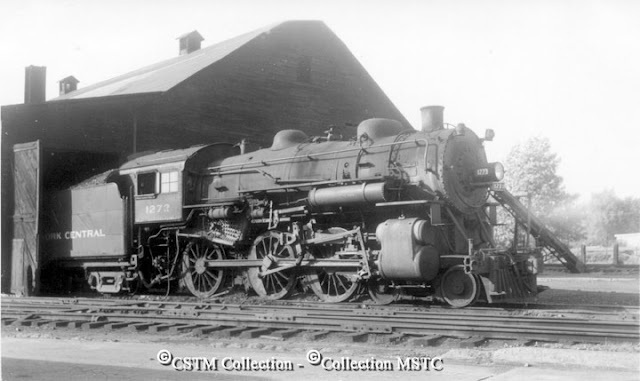 I would love to see those old OSR F units and vintage locomotives in my hometown. 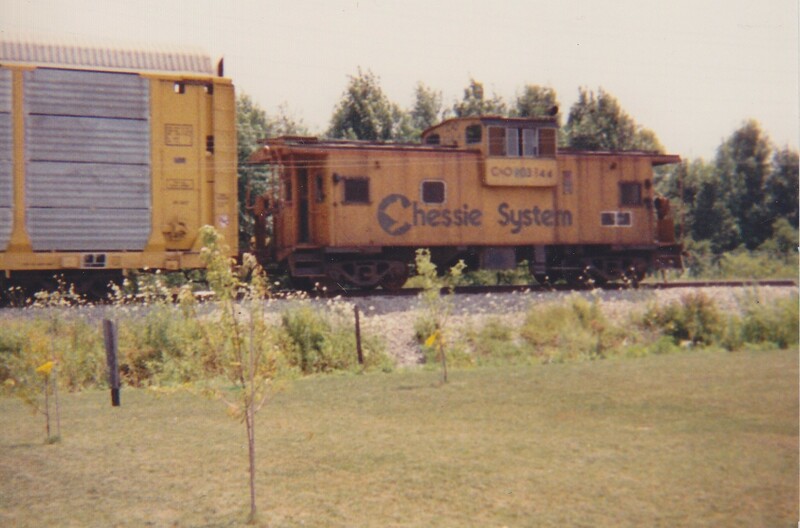 But I think I might raise a glass to the railway of my youth – the old Chessie System. It’s the railway that often woke me in the middle of the night when its freight trains would announce their presence by the two long, two short, one long horn blasts all the way through town. Even when I was young, I always found the sound reassuring and comfortable. The CSX was the railway that used to distract me from my soccer games in the summer in Parkdale Park. The CSX was the railway that produced countless summer chases as I raced to the tracks with my bike in the hopes of snapping a few shots. The CSX is the railway whose old MoW cars were used for climbing on a tiny spur Port Lambton, where I went to school. Despite the open access to the old cars, they were never vandalized or damaged. How times change. Fall 1992 - These MoW cars were often parked in Port Lambton, where I attended school. I recall climbing these cars on occasion, back when a railway could leave cars parked on an unprotected spur in the middle of a town and nothing would happen to them. You get the idea. I’m not so much mourning the disappearance of the railway that I know as I am mourning the loss of its legacy in parts of Canada, especially around my hometown, but also in Windsor, Essex County, Niagara, St. Thomas and parts of Quebec. Hard to believe that this railway once served so many areas in Eastern Canada. But there is no room for sentimental nostalgia for a publicly traded railway in 2018. I look at what’s become of CSX in the last year and it seems like there’s almost no room for nostalgia with this railway. It’s a shame because a railway with such a colourful history deserves better. I didn't get around to putting together a post about the best moments from 2017, although I did devote one post to the Via Rail highlights (and there were many!). So, although it's nearly February, I wanted to take a look back at some cool moments trackside from 2017. Although my time trackside was miniscule last year, I was happy to have some incredible luck this year. The first instance of some good luck happened in May when my family made a trip to Southwestern Ontario to visit family and attend a family reunion over the Mother's Day weekend. I made my way to Wyoming and camped out at the town's tiny Via Rail station, hoping to catch a freight train on the Strathroy Subdivision. After sitting for an hour, I was just about to return back my Dad's house in Petrolia when I saw something far off in the distance making its way west. The best part of this freight train was that it had five (count 'em) engines leading the way. This is a rare site in modern railroading, as most modern diesels are matched in pairs or trios on the head end of a freight train. This lash-up reminded me of watching trains when I was younger when four to five engines on the head end of a train wasn't all that uncommon. So, mark it down as the first time I have seen this type of locomotive line-up in many years. Later in the summer, I was again visiting family in the Sarnia area when I caught my first train on the St. Clair River Industrial Spur near the Rokeby Line, south of Corunna. I lived near this spur when I was growing up, but I was never able to get a shot of any trains on this line. I managed to catch this rain switching near the Suncor ethanol plant. Check out the old motive power and the giant power lines. This might be my favourite shot from last year. During the same week in late July/early August, I was able to stay at my sister's house south of Corunna. Her property backs onto the CSX Sarnia Subdivision, which is a pretty quiet line these days. I was hanging around my sister's backyard, as my daughters were enjoying an afternoon siesta when I heard a train approaching the nearby Rokeby Line. I was able to position myself near the tracks and get this shot of a short train heading back to Sarnia. Later in August, I was in London for a family wedding when I was able to break away from the family events to get some trackside time in. I saw a number of cool things during my time at the CN London East yard and the CP Quebec Street yard. At the CP yard, I was able to watch a local doing some switching, which included my first golden rodent-clad unit. At the London East CN yard, I saw a lot of interesting things, which you can see in this post, but the highlight was a CN container train rumbling through. I don't see these trains at all, since Ottawa had no mainline action of consequence, so it was cool to see my first container trains in years, especially from the Highbury overpass. In October, I came across an idling mixed freight that was parked in between Wyoming and Camlachie Road. You can read about this meet here. This was a surprising meet for me, since it was the first time I have seen two cowl units on a freight train. It's always cool to come across these relatively rare units, but having two on the same train was especially cool. And as you may have read from this recent post, I was quite happy to catch my first Goderich Exeter Railway action shots in Kitchener in November. You can read about my adventures in Kitchener in this post. For those who missed it, I caught a duo of GEXR units tying up at the Kitchener railway station, including this unit, LLPX 2236. I didn't share this photo in my original post. There were a number of other firsts last year, but these are the ones that I feel are most significant. Last year was a year where much of my trackside time was condensed into a few jam-packed weekends. I'm hoping to get going on some photography this year. If I can check off half as many items from my to-do list as I did last year, I'll be quite happy.